Four Seasons’ urban site called for First Avenue storefronts and pedestrian features such as canopies and lean rails for the bus stop. The 6,000-square-foot spa includes a steam room, hot sauna cabin, showers and a private couple’s room. • 11 unsold condo units range from 1,300 square feet to more than 7,000 square feet. Prices range from $2 million to more than $15 million — an average of around $2,100 per square foot. • Hotel room rates start at $365. • Fran’s Chocolates has opened in one of the two available commercial spaces. Four Seasons veteran Kerry Sear, former chef and owner of Cascadia in Belltown, runs Art Restaurant and Lounge, the hotel restaurant. • Hotel features include a business center, 4,900-square-foot ballroom, five meeting rooms, a fitness room, 6,000-square-foot spa, and an outdoor pool and fireplace. • The first condominium owners moved in earlier this month. • The new public stairway between Union Street and Western Avenue has 103 steps. 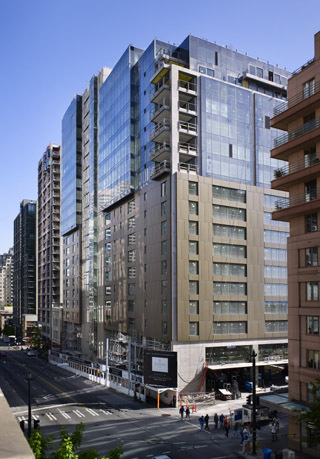 • The ownership group’s managing principals include John Oppenheimer, CEO of Columbia Hospitality; former Seattle Mayor Paul Schell; and Tom Alberg, managing director of Madrona Venture Group. Other investors include Bruce McCaw and the Muckleshoot Indian Tribe. "How Four Seasons returned to Seattle"
"Four Seasons delivers a jolt of urban energy"